Q&A forum › decoder program? Thanks VERY much for the sample config files for base and rover. I programmed the Ublox Configure function for ESPrtk. In my opinion, you don’t need decode program, just read the datasheet about its configuration protocol. If you want Enocde, the easiest way is to use their U-Center. Open U-Center and choose CFG-CFG. Select Show Hex Tonggle and you will see the configuration code. 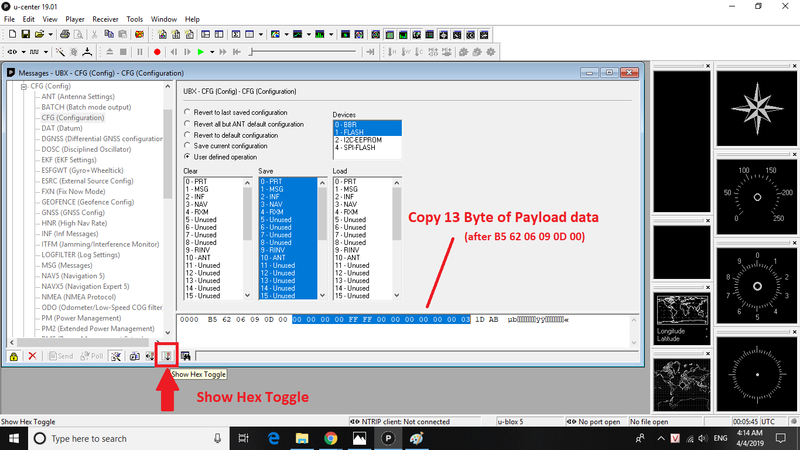 You need to Copy the 13 Payload bytes behind the first 6 bytes (B5 62 06 09 0D 00) . They are [ 00 00 00 00 FF FF 00 00 00 00 00 00 03 ]. You can then add to your configuration file. Please add to the end of the file. If you want to Decode, look in the documentation for the configuration protocol. 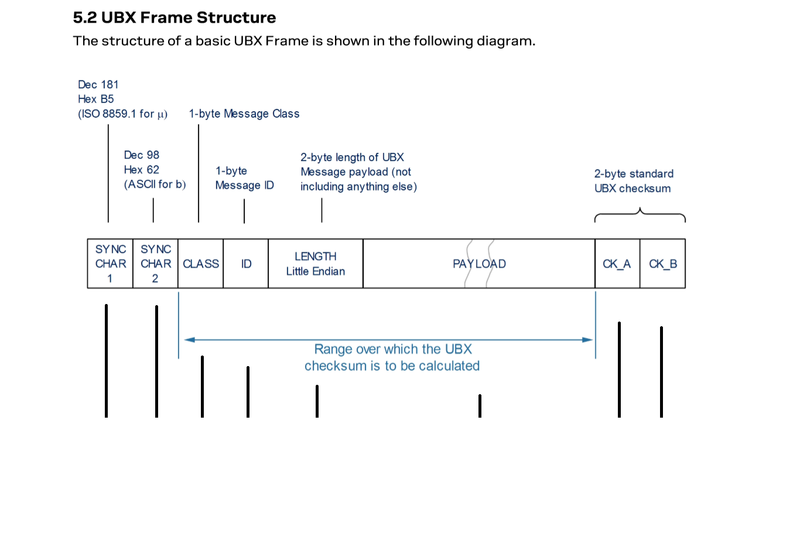 /*The structure of a basic UBX Frame is shown in the following diagram. 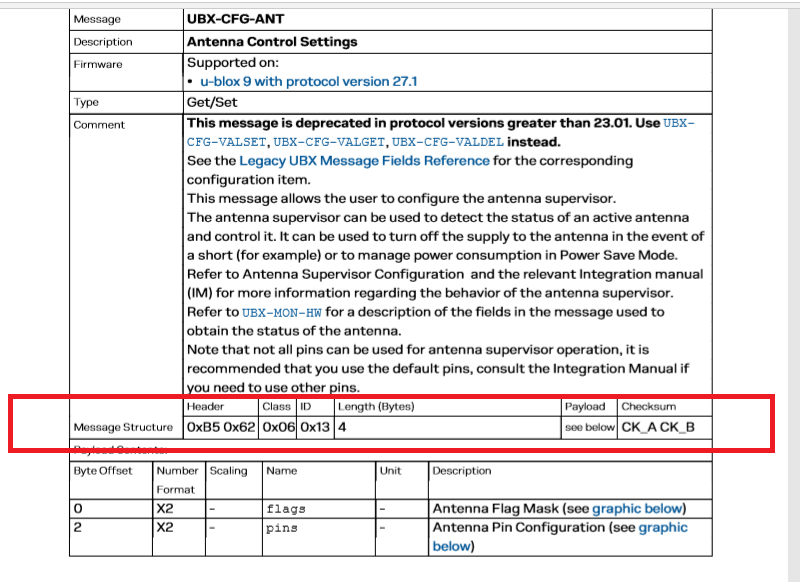 • <ID> : A 1-byte Message ID field defines the message that is to follow. the length field is a Little-Endian unsigned 16-bit integer. • <PAYLOAD> : The Payload field contains a variable number of bytes. • <Checksum_A> <Checksum_B> : The two 1-byte CK_A and CK_B fields hold a 16-bit checksum whose calculation is defined below. I think I do need a decoder, in order to understand what’s going on in these expensive gps’s. Guess I’ll have to write one. Sounds great . Besides, the new function CFG-VALGET will also help you in decode and decompose the stored data.